The Egyptian god Tatenen, sometimes written as Tatjenen, symbolizes the emergence of silt from the fertile Nile after the waters of the inundation recede. The meaning of his name is uncertain but may possibly mean "the rising earth" or "exalted earth". He is usually depicted as entirely human (though with the beard of a god) in appearance, though he may be shown wearing a twisted ram's horn with two tall plumes (ostrich feathers), sometimes surmounted with sun disks, on his head. However, his face and limbs are often painted green in order to represent his connection as a god of vegetation. Furthermore, he could also be a she. One papyrus in the Berlin Museum calls Tatenen "fashioner and mother who gave birth to all the gods". - Tatenen was the arable land that was reclaimed at Memphis from papyrus swamps through irrigation projects. - He was a very specific piece of land at Memphis, submerged by the annual flood that, after it receded, reappeared. 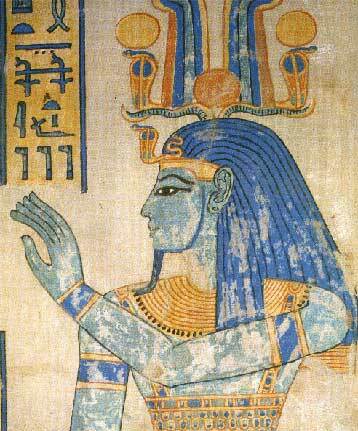 - Tatenen was a personification of Egypt and an aspect of Geb, the earth god. "Hail to thee, thou who art great and old, Ta-tenen, father of the gods, the great god from the first primordial time who fashioned mankind and made the gods, who began evolution in primordial times, first one after whom everything that appeared developed, he who made the sky as something that his heart has created, who raised it by the fact that Shu supported it, who founded the earth through that which he himself had made, who surrounded it with Nun and the sea, who made the nether world and gratified the dead, who causes Re to travel in order to resuscitate them as lord of eternity (nhh) and lord of boundlessness (td), lord of life, he who lets the throat breathe and gives air to every nose, who with his food keeps all Mankind alive, to whom lifetime, [to be more precise] limitation of time and evolution are subordinate, through whose utterance one lives, he who creates the offerings for all the gods in his guise the great Nun (Nile, in this case), lord of eternity, to whom boundlessness is subordinate, breath of life for everyone who conducts the king to his great seat in his name, 'king of the Two Lands'." Of course, it must be noted that this hymn is specifically directed to Ptah as Tatenen. But in this guise he seems to have created everyone. Even Imhotep, after his deification, was also associated with Tatenen through Ptah. In a small temple dedicated to this great thinker of ancient Egypt, we find Imhotep described as "threat one, son of Ptah, the creative god, made by Tatenen, begotten by him and beloved by him..."
Though Tatenen is most closely associated with Ptha, we do find assimilation with other gods, includingÊ Osiris, Sokar in their function as earth deities, and later with Khnum. Also, in the Books of the Netherworld he is closely associated with Re. During the New Kingdom he became particularly important, taking on a protective role towards the royal dead, guarding the kings and their family in their path through the Underworld. 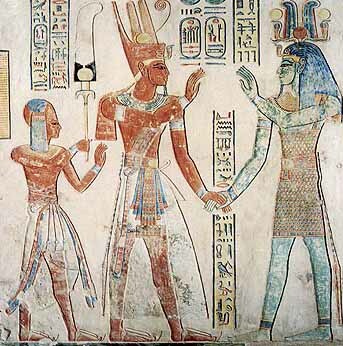 For example, in the tomb of Amunhirkhopshef in the Valley of the Queens, on the West Bank of Thebes (modern Luxor), Ramesses III, the father of Amunhirkhopshef is depicted in a scene where he asks Tatenen to look after his young son. In fact, in the Book of Gates, Tatenen personifies the entire area of the netherworld, protecting the deceased in the Beyond. He is able to rejuvenate the sun on its nocturnal journey. In the Litany of Re, however, another Underworld book, he is listed as the personification of the phallus of the dead king.